Every week, I name the individual who displays amazing brass clock weights which we can all say “Wow, now that guy has some freakin stones.” The person needs to be a guy (but not always), somewhat famous (but the 15 minute version works well too), and simply could give a crap about the outcome and just goes for it. This week, it’s not even close. 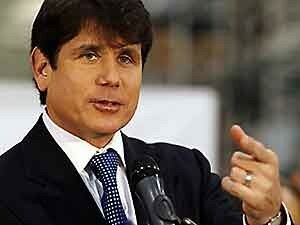 Governor Rod Blagojevich of Illinois just might be the poster-boy huge clockweights. Heck, I may even rename this award after him. He is UNBELIEVABLE. He has such massive beans, he has to walk around with a wheel barrel. Look, I appreciated jammin it to “the man” as much as anyone, but I am perplexed how he could do what he is doing right now. Today, Governor Blagojevich decided to appoint Roland Burris to fill Barack Obama’s US Senate seat. This is his civic duty under the 17th Amendment to the US Constitution. But, unless you have been chillaxing with Bin Laden in a cave during the past couple of weeks, you know the good Governor is accused of trying to sell Obama’s seat to the highest bidder. He is on tape, dropping F-bombs, and spouting how valuable this appointment is to expanding his wallet. So all this comes to light and the Dem’s in the US Senate told him to get stuffed. They will not vote to approve ANYONE who he names, for the obvious reasons. The Illinois House is trying to impeach the guy; the Attorney General is trying to put him in jail ASAP; and even Obama has said the guy should step down. 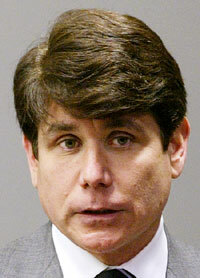 What did Blagojevich do? He appoints someone anyhow. Forget Arnold, this guy is the Governator. He literally is shoving his middle finger in the air to anyone and everyone. How is this manly, you ask? I won’t argue he’s not scum – because he is. He is on tape saying he wants freaking everything for the appointment. However, we love America and we love the fact we are all innocent until proven guilty. He just may be guilty of a crime and he is certainly guilty of being a very large bonehead idiot. But innocent he is until charges have been proven. He is doing his job by appointing someone to represent the good people of Illinois. He is also fighting for his political life (and personal freedom). Not sure if any of this is worthy of manliness, but what huge cojones he has. That is something we can all admire, maybe not be totally proud of, but admire nonetheless. One of the manliness themes here at Return To Manliness is taking responsibility. Most politicians who denounce this guy are MASSIVE hypocrites. Every vote is for sale and we all know it. People all over want to vilify him for his alleged actions, but this is simply how politics works. Not just American politics, but politics all over the world. Don’t think for a second that every vote, every endorsement, every action, and yes, every appointment, is worth something to someone – and EVERY politician knows it. I have some experience in local politics and I can say without any reservation, that nothing was given for free. From the littlest of requests to the largest – they all came with a price. Not always money in the form of campaign contributions, but nevertheless reciprocation was the name of the game. No…I certainly give the esteemed Governator from Illinois the top prize in being an arrogant POS and a generally humongous idiot, but I also understand he did what most other politicians do as a matter of fact. The man has “cojones”, but he is a typical (or should I say a REAL) politician. And a typical politician cares only for himself and his personal ambitions. So I don’t like the man. .-= Robert Real-Man R.´s last blog ..My first video on YouTube =-. This guy’s a POS doing what trapped rats do. It’s not cojones, it’s a sense of entitlement, and there’s not a hint of anything manly about him.